There is an installation at The Curve in the heart of the Barbican Centre that allows you to walk through the rain without getting wet – no umbrellas provided. It is Random International’s Rain Room and it is a thing of beauty to behold and to walk through. Walk slowly and the movement sensors in the ceiling will track you and keep the rain from falling on your space; as you walk you mould a dry bubble around you. If you walk too fast you get wet. On some days (all too few: for details you will have to consult the Barbican website) the space is shared by dancers from Wayne McGregor | Random Dance, which adds a whole new, fluid dimension to the installation. Jessica Wright and Davide Di Pretoro were dancing on the day I attended and because dancers and onlookers are subject to the same laws of motion sensors, Wright and Di Pretoro were performing uniquely adagio movement, something one doesn’t often have a chance to savour in a McGregor performance. Wright performs for fifteen minutes: a solo, a duet with Di Pretoro and another solo. The vocabulary is based on articulation of all joints and limbs which, slowed down, has the sense of tentacular motion under water, current-driven, rippling, though there is tension in the extended hands and feet and at the limits of articulation. 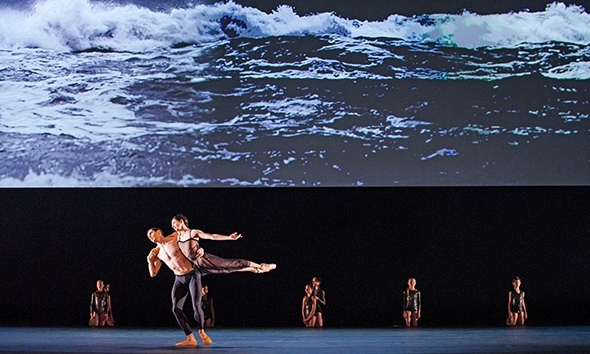 As the dancers move, they push the boundaries of the rain around them, creating a dry oasis that moves with them. McGregor says he has structured 25 hours of choreography for this event, but as you are limited to five minutes in the room because of space requirements and because the queue extends to five o’clock and beyond, the 25 hours will remain largely unseen. The dance sequences are part choreographed and part improvised, and the nature of the performance, by virtue of the way it is presented, is open-ended. With one floodlight at the far end of the room, the effect of seeing the dance through the illuminated rain is beautiful. As McGregor says in the video link below, to see the installation is to see the rain as a spatial object and the dancers as artifacts in a performative exhibition. Pina Bausch may have preferred her dancers to get wet and to have the sensation of getting wet, but Random International’s Rain Room offers something between projection and the real thing. A score by Max Richter envelops the piece in a suitably fluid sound, not quite watery but sensuous. Random International (no relation to Random Dance) has not yet got the measure of a dry floor so after fifteen minutes of dancing the shoes get quite wet, but for those walking through in the allotted five minutes there is no need for wellies. Another piece of advice for those who would like to experience the Rain Room: the motion sensors see you better if you wear light-coloured clothing (the dancers are in skin colours) and black may fool the sensors into raining on your absence. Aware of the time constraints on the viewer for this brief, sensory experience, McGregor calls it a snapshot of dance, and there is certainly plenty of that, almost more snapshot than dance: it is a photographer’s delight. But in that snapshot is an opportunity to see beautiful dancers up close in a weather system that enhances the experience. Keep calm, walk slowly, and wear bright colours. It will brighten up the Rain Room, and (if you can arrive early) your day. The Rain Room is open until 3 March 2013 and Wayne McGregor | Random Dance will be performing again on Sun 20 January 2013 and Sun 24 February 2013 (11am – 5pm). Entry is free to both the Rain Room and the performances. You can find out more about the Rain Room exhibition on the Barbican Centre website.